I’ve been a wee bit obsessed with weaving lately, ever since May when I saw these beautiful pieces made by Rachel Denbow. After seeing cardboard looms all over Pinterest this summer, which totally fueled my fixation, I decided to make some looms myself for my little campers. This week I had five girls at art camp ranging from ages five to seven (and one 14 year old helper extraordinaire). 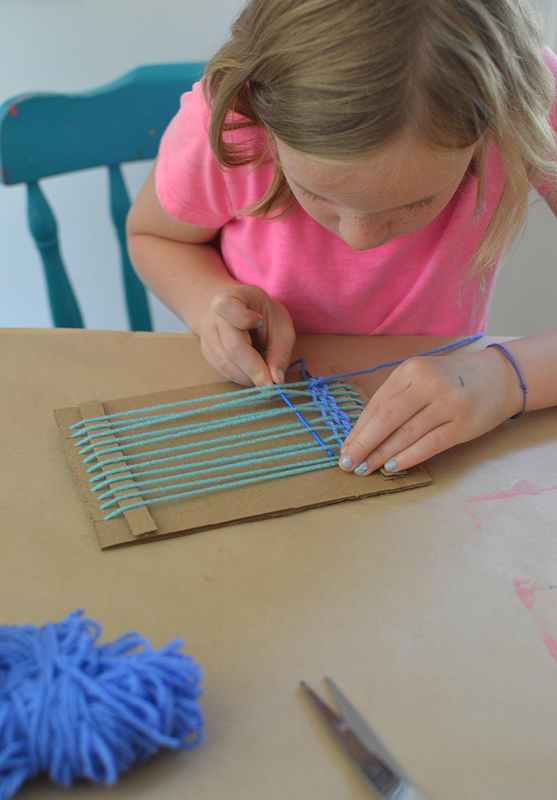 Since I had never tried weaving with young children, I wasn’t sure what would happen, or if they could even handle weaving, but I decided to just give it a try. ~ A piece of cardboard about 6” x 8”, and two strips for the top and bottom. 1. Take your ruler and put it across the top of your piece of cardboard, about 1/2” from the top. Draw a straight line with a pencil. Now measure in 1” and make a hash mark. Continue on and make 12 hash marks about 3/8” apart all across the top. Do the same at the bottom. You can space them out however you would like, but this is just what I did for my looms. 2. Using an exacto knife, or scissors, cut along each hash mark, stopping at the 1/2″ line. 3. Glue on the strips of cardboard so that the top of the strip aligns with the 1/2″ line (strips are about 1/2″ wide). 4. Cut 12 pieces of yarn and thread each notch, making sure to leave a tail of about 3” on the back. Tape these ends to the back with scotch tape. Make sure the threads are fairly tight (but not so tight that it’s stretching the yarn). These vertical threads are called the warp. You have your loom! 1. Cut a piece of yarn about 2 feet long. Thread it through the plastic needle and then tie a knot at the top of the needle. 2. Starting with the first warp thread, slide the needle underneath and then up over the next thread, and then back under the third thread, and so on. Use this under-over pattern until you get to the last warp thread. When you get to the end of your first row, pull it through all the way, leaving about a 3” tail. You can tie this tail in a knot around the first warp thread to secure it for the little kids, but after they weave two rows it won’t be in danger of coming out anymore. 3. For your next row, go back the other way by doing the opposite over-under pattern as you did for the first row. (If you go under and over in the same way as the first row you will be undoing what you just did. This mistake does happen with the littles so make sure to check on them before they begin each row in the beginning, Eventually they get the hang of it). 4. Once you have a few rows, use your fingers to push up the weft yarn so that it’s snug. Be careful not to pull too hard on the weft yarns after each pass through because your weaving will start to cinch in at the middle. Of course, this did happen to all of us, but I thought I should warn you anyway! First time weaving mistakes. 5. When you are done with your first color yarn, or if you decide you want to switch colors, simply end it with about a 3” tail remaining. It might start to look sloppy with lots of tails hanging out all over, but don’t worry ~ all of them will be taped to the back at the end. 6. Start the next colors in the same way you started the first, leaving a tail of about 3”. 1. When you are finished, undo the scotch tape in the back and carefully pull off the warp threads. I didn’t take any pictures of this process for some mysterious reason, but it’s fairly straightforward…it’s just that you have to be careful because the weft threads could come off easily. 2. When your entire weaving has been pulled off of the loom, tie all of the warp threads together at the ends. Tie 1 & 2 together, 3 & 4 together, and so on. You should have six knots at the top and bottom. Double knots. 3. At this point, it’s time to deal with the tails coming out of the sides. The reason to leave the tails on the longish side is so that you can thread them through the needle, and then gently weave them through the back a few times before trimming them. If you don’t want to take this extra step, you could just tape the tails to the back with masking tape. 1. Technically, you are now done with your weaving. Hooray! 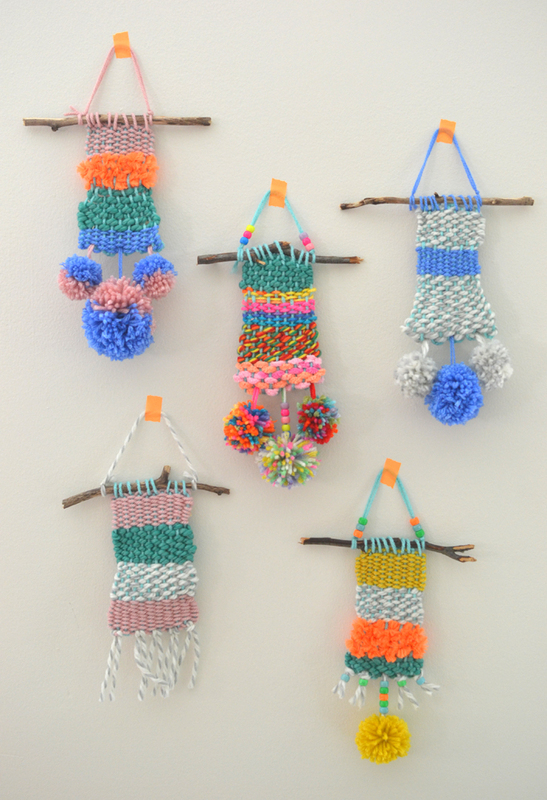 But if you want to embellish with pom-poms and beads, and hang it on a twig, then read on. Just a note: The kids didn’t do any of the finishings, except for the pom-poms. I did all of the taping, beading (kids picked out their colors) and attaching it to the twig. They watched as I did it all, but it was too finicky for their little hands. 2. We made our pom-poms with a pom-pom maker (I highly recommend these things…they are good for life!). But you can also do it the old fashioned way: around your fingers. Here is a good tutorial for that way. 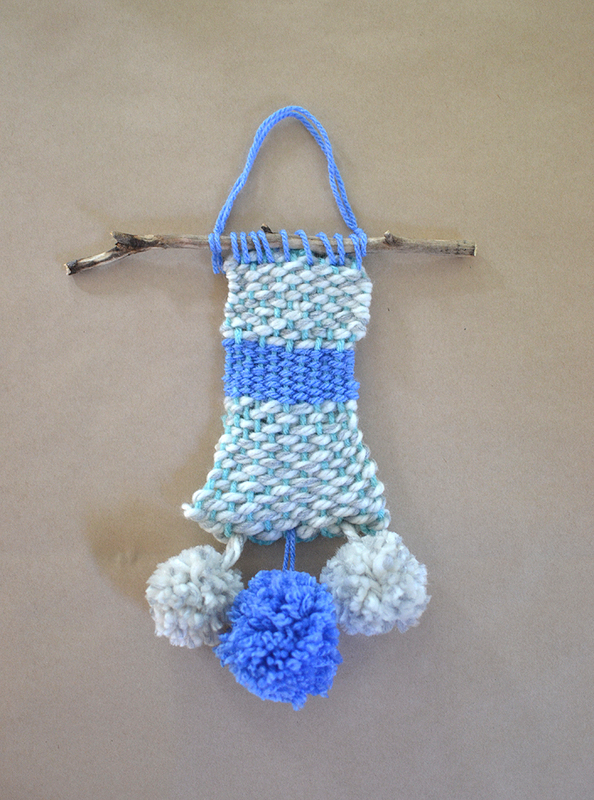 Don’t forget to leave a longish tail with the piece of yarn that you use to tie the pom-pom. You will thread this tail through the needle and then attach it to your weaving by going through the bottom (front to back) and then taping it on the back. 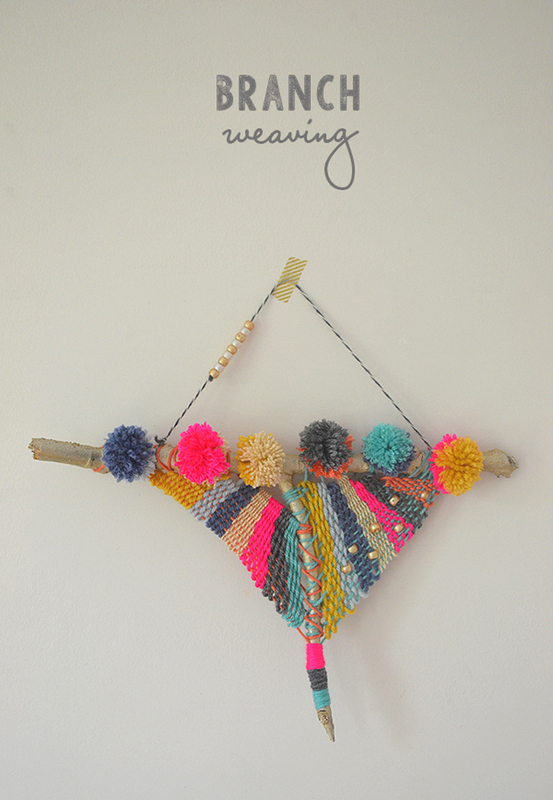 You can add beads to your pom-pom before you attach it to your weaving. 3. 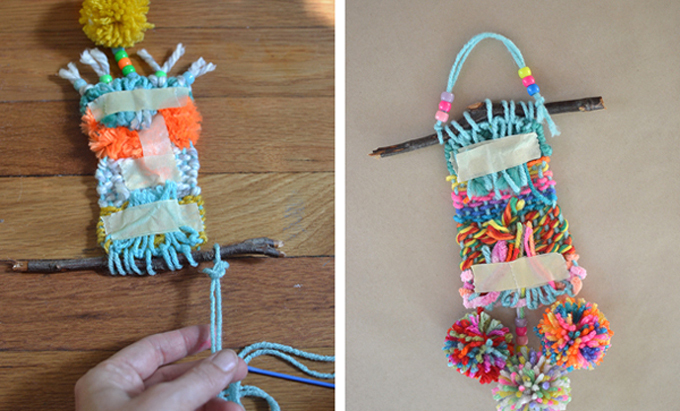 To attach the weaving to the twig, cut a piece of yarn, about a foot long, and string it through the needle. Starting on one end, loop the threaded needle through the top of the weaving and around the twig, wrapping the twig all the way until the end. Tie knots on either end, then trim and use masking tape to tape the ends to the back. 4. Lastly, to attach the hanger, simply cut a piece of yarn about 18” long (this will be trimmed, but better too long than too short), and fold it over. Loop the folded end around one side of the twig and make a knot. If you want to add beads, now is the time. To finish off the other side just tie it around the twig in a double knot and trim. I know there are like a million steps, but the steps for the kids are pretty simple and fun. It’s the making of the loom and the finishing that involves some busy work on the part of the adult. I personally LOVE busy work…and I’m betting that if you’ve read this far, you do too. Here are some other versions that we did without pom-poms and using popsicle sticks. I didn’t have time to collect twigs for this group and we didn’t have time for pom-poms, but they are still so cute!! One thing I forgot to mention is that this project is a great way to introduce some new vocabulary for the kids. 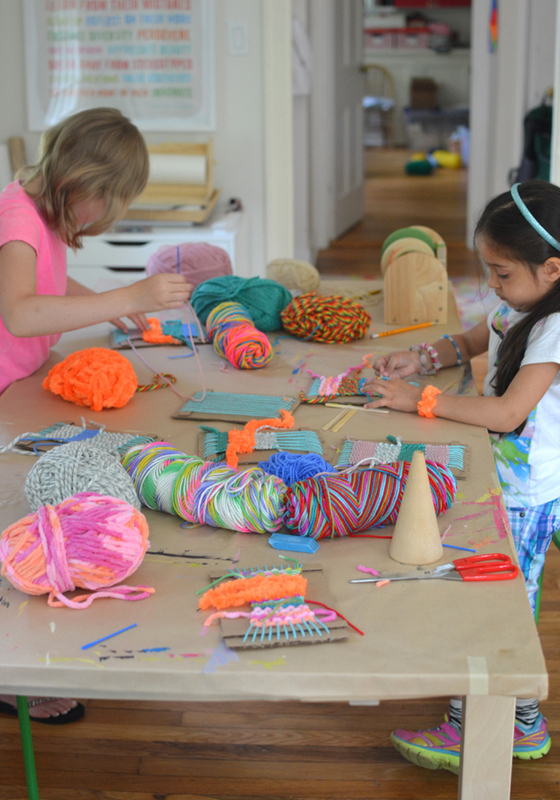 They learned warp & weft, and they learned about woven fabric vs. knit. We talked about how so many things in their world are woven: the shorts they are wearing, their sheets and pillows, towels, tablecloths. It was such an eye opener and so fun to see all of this new knowledge sink in. I hope you try weaving, it really is so cool. stop it. just stop it. it’s just too good!!! you are funny. thank you!! These turned out so fantastically! The kids must feel like magicians! What a fun class and completely success! You’re really inspiring these artists to weave rainbows, Bar! Love them. I am obsessed with weaving too and I think this just made me more obsessive! AMAZING!!!!!!!! So beautiful!! I’m going to show this to my daughter, she is six, and I’m sure she will love to give it a try. Thanks for sharing! 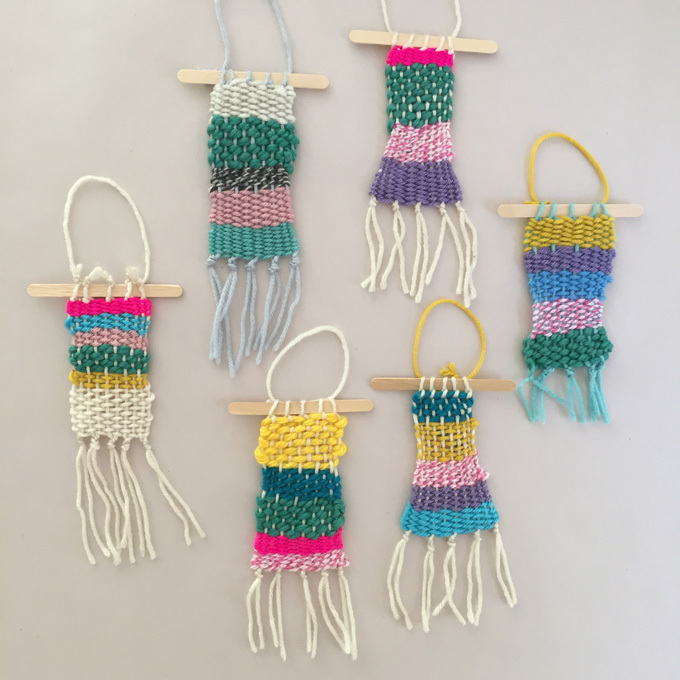 Amazed by your beautiful + textile post on weaving today! Thank you for bringing weaving back in a modern + stylish + fun direction with all your fabulous colors + textures + exciting additions! Inspiring!!! What a great post! 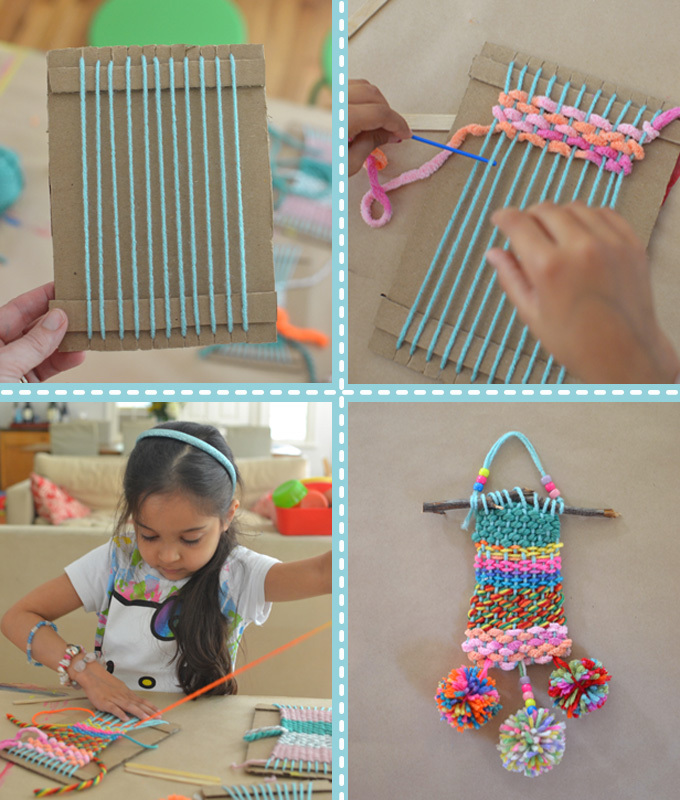 I have been looking for simple, kid friendly weaving crafts! 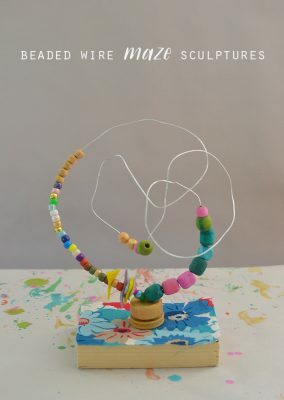 And what a fun craft for kiddos to do! 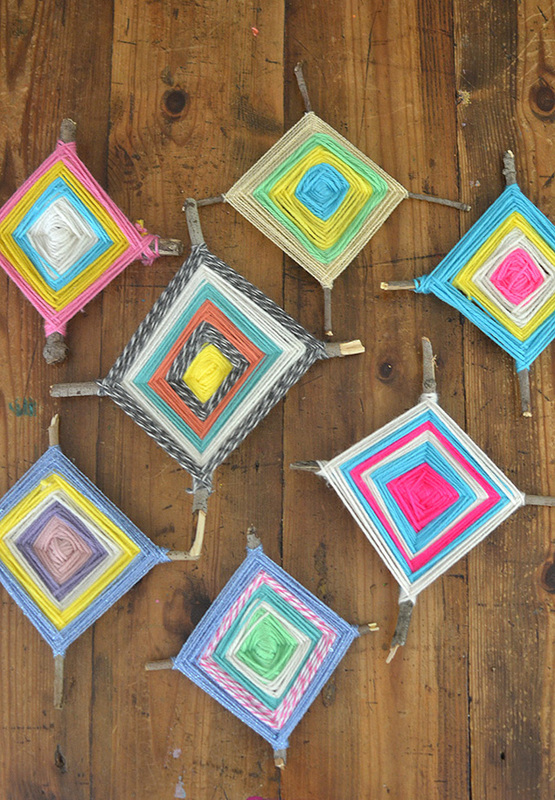 To make their own, colorful wall hanging or tapestry! How fun. Love that. I wanted to ask, how do I go about hanging these on a bedroom wall? And what to use. Love this! I am so glad that the pin I had “repinned” on Pinterest was reported as copyright infringement (by you, I assume), because I clicked through and finally tracked your actual website down. I’ve repinned now straight from this post. You have a beautiful blog and I applaud you for being diligent about copyright. I was lazily clicking “Pin it” and don’t usually do that without clicking through first. I’m glad I found you! I Love your blog. I am a fan of you. 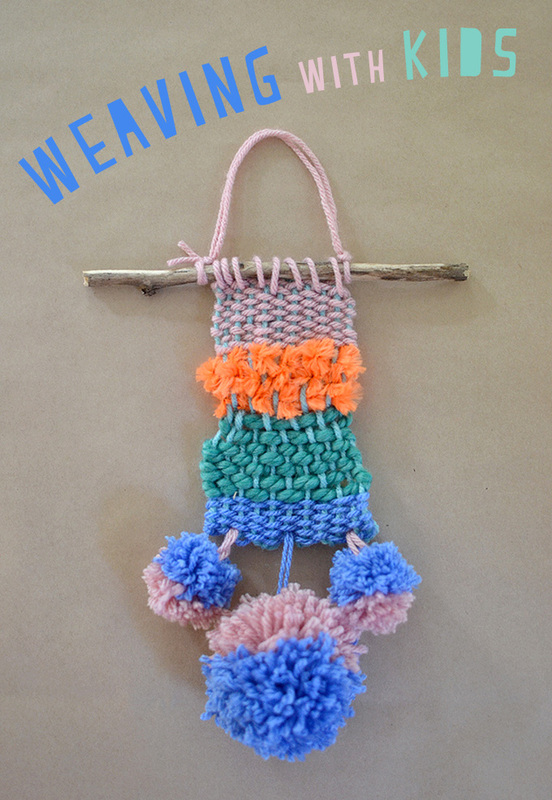 I try last week your weaving tutorial and I write a post for Les enfants Terribles Mag & for me too! These are beautiful! I have the special pleasure of getting to teach art in my son’s kindergarten class every week. Do you think this is something that 20 kids could do at once or would it get frustrating for little ones? Thanks for letting me know! Thank you for great ideas, it’s super. Oh I love your page!! So colourful! Such a pity the kids are asleep yet – I just could start make some things from your page wright now! But I pinned a lot and we´ll do! 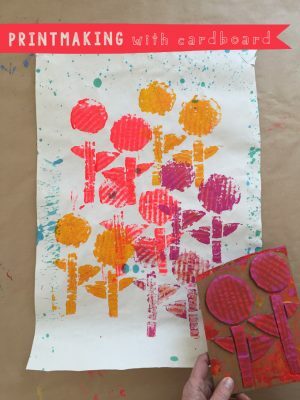 I love this simple project that you’ve done with the kids. I would like to use some to the pictures for my summer camp. No instructions would be shown. But I would like your permission to use this project! Hi! Thanks for this great idea, i’m going to make this with my kids. Do you know craftkitchen.nl is using your instructions and photo’s? 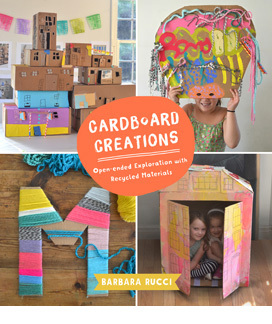 Oh wow, this is a wonderful project that I’m so going to use with my first graders. Great post! We’ll be using this to earn our Textile Arts badge this weekend with American Heritage Girls. Thanks for the clear instructions. I know my girls will be so excited. Hi, love that you’re spreading the love of weaving around. I’ve been doing it with children for about 10 years on and off and they all love it, once they get the rhythm. I have to say though that it’d be great if you teach them to finish the tails properly 🙂 Just thread one tail onto a large eyed needle and weave in and out, making the tail finish on the back side of weaving. The tape you used to finish will eventually fall off and then a lot of hard work may fall apart. There is also a way to attach the warp(up and down threads, I always mix up the names, sorry if I did!) but it’s a bit hard to describe so you could probably google it. It’s a way of wrapping thread around so that it’s one continuous thread rather than one for each warp. Love your posts by the way! I found the creative idea for the kids really great! To prepare the gifts of teachers, I proposed to my children to realize this pretty object of decoration. They loved it and most of all, are proud of it. I show their creations on my blog. So I took the opportunity to present your blog. I did not recover the image of the tuto out of respect for your work. So I inserted the link of your article, if my readers want to know more. Oh this is just too cute! 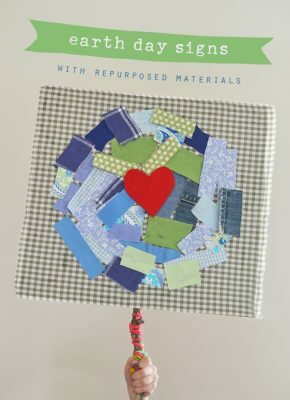 I just went and bought most of the materials (thank you for the amazon refrences) and can not wait to introduce this to my almost 5 year old daughter! She absolutely loves art and doing things on her own (we have hit the independent, I can do this by myself mom stage) so I know she will be so proud of of the finished piece! Thank you for the easy to follow instructions. I just subscribed to your blog so Im sure we will be trying many more of your wonderful creative ideas! Loving your emails so much! Between them and the #100daysofartbar Insta prompts (I’m @raising.kinley on there 👋🏼), you’ve made this homeschoolin’ momma’s life incredibly easy! I think we’ll give these gorgeous weavings a try today 😍 Thank you Bar, and extra thanks for the super detailed instructions! 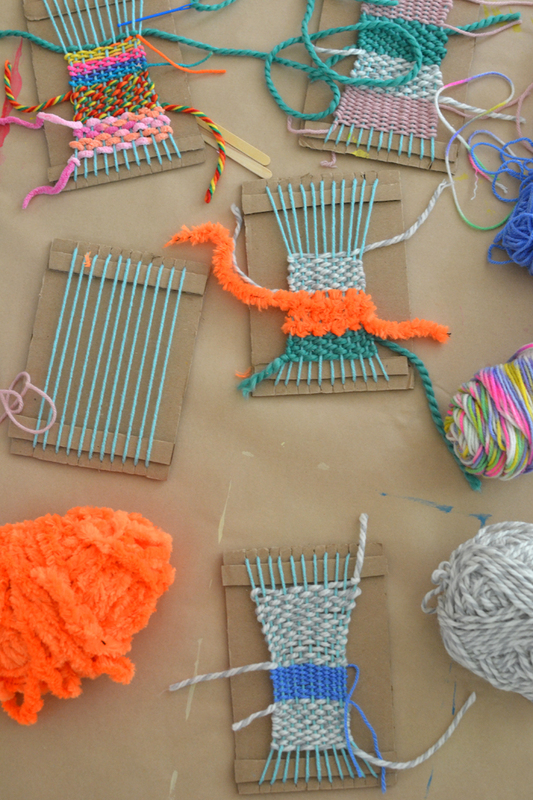 Thank you for this, I want to do weaving with my class of 30 so this is a BIG help! May I ask, the last picture, on the crossed sticks, is this still weaving? Thanks so much. I’m going to use this for a teenage girl pupil with fine motor skills issues. Do you think they would be patient enough to weave scarves for themselves? Lovely! I am wanting to do this with a class of fourth graders to learn about textiles. How long about dodbot take your kiddos to finish a project?